Billings, S.A., D. Hirmas, P.L. Sullivan, C. A. Lehmeier, S. Bagchi, K. Min, Z. Brecheisen, E. Hauser, R. Stair, R. Flournoy, and D. deB. Richter (2018) Loss of deep roots limits biogenic agents of soil development that are only partically restored by decades of forest regeneration. Elementa Science of the Anthropocene. 6: 34. Doi: 10.1525/elementa.287. Kerbs, B., J. Ressler, J.K. Kelly, M.E. Mort, A. Santos-Guerra, M.J.S. Gibson, J. Caujapé-Castells, D.J. Crawford (2017) The potential role of hybridization in diversification and speciation in an insular plant lineage: insights from synthetic interspecific hybrids. AoB PLANTS 9:plx042 doi: 10.1093/aob0pla/plx043. Colyott, K., C. Odu, and J.M. Gleason (2016) Dissection of signaling modalities and courtship timing reveals a novel signal in Drosophila saltans courtship. Animal Behaviour 120: 93-101 doi:10.1016/j.anbehav.2016.07.015. Archibald, J.K, Kephart, S.R., Theiss, K.E., Petrosky, A.L., Culley, T.M. (2015) Multilocus phylogenetic inference in subfamily Chlorogaloideae and related genera of Agavaceae - informing questions in taxonomy at multiple ranks. Molecular Phylogenetics and Evolution. 84: 266-283. Freeman, C. and M. Mort (2014) Multidimensional niche divergence: Analysis of climate factors in the distribution of Crassula in the Cape Region of South Africa. The Beloit Biologist. Niehaus, P. (2014) Performance study of supertree methods. KU Journal of Undergraduate Research. Summer 2013 - Spring 2014:41-45 . Arquilla, A.M., P. Roy and J.M. Gleason (2016) The Role of Visual Signals in Drosophila biarmipes Courtship. Presented at the annual meeting of the Animal Behavior Society, Columbia, MO. Poster. Cole, T.J., and J.R. Walters (2016) Molecular Evolution of Sperm Proteins in Danaus Butterflies. Emerging Researchers National Conference in STEM, Washington D.C. Poster. Dörnhofer, H., B. Foster and J. Forsythe (2016) Stand composition, structures, and dynamics in a mature oakhickory forest of northeastern Kansas. Emerging Researchers National Conference in STEM, Washington D.C. Poster. Dixon, J. and A.E.Z. Short (2014) Distribution and species richness modeling of the water scavenger beetle genus Tropisternus in Northeastern South America (Coleoptera: Hydrophilidae). Contributed poster. SACNAS. Los Angeles, CA. 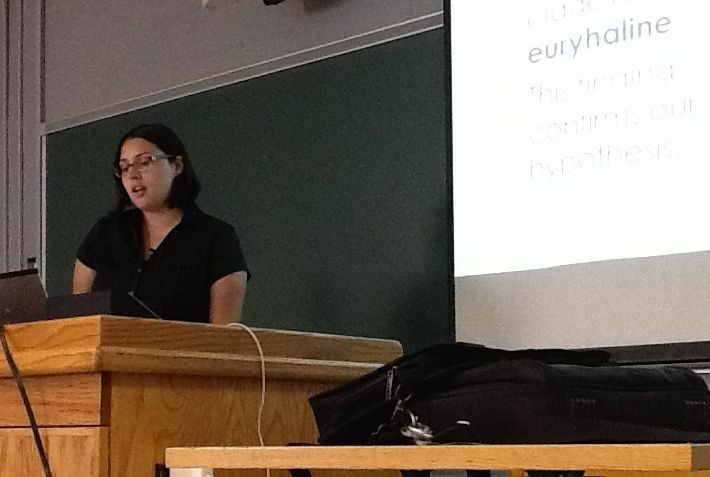 Freeman, C. (2013) Resolving diversity: Phylogenetic analysis & ecological niche modeling of Crassula,” Contributed talk. 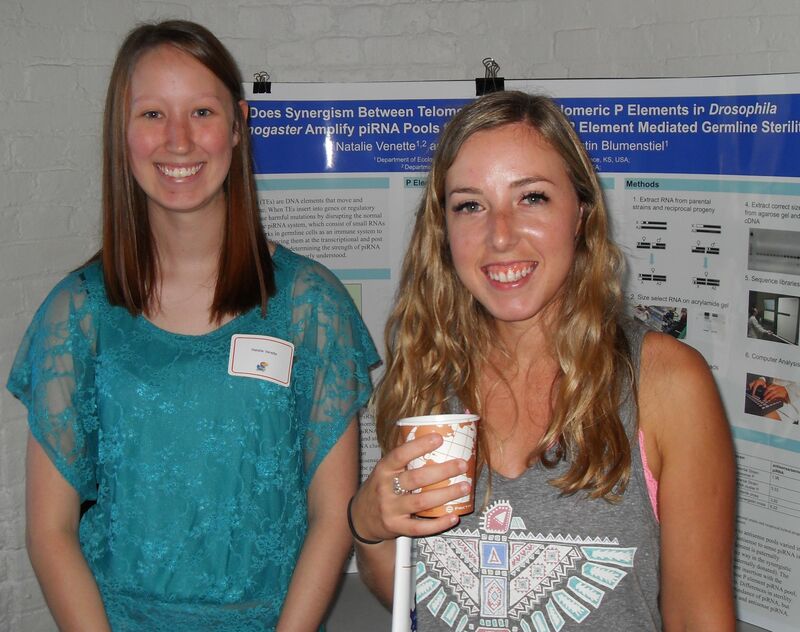 Midstates Consortium for Math and Science Undergraduate Symposium. St. Louis, MO. Nov 2013. Freeman, C. (2013) Resolving diversity: Phylogenetic analysis & ecological niche modeling of Crassula,” Contributed poster. 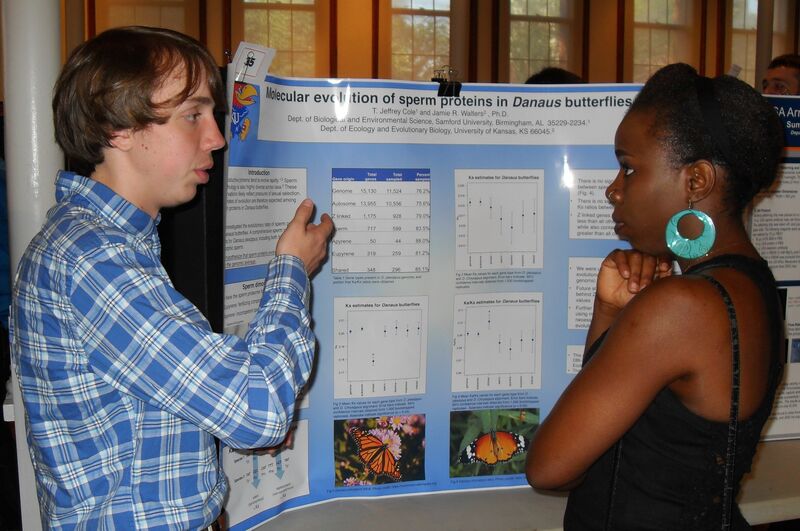 Beloit College Department of Biology Research Presentation. Beloit, WI. Oct 2013. Hale, L. and J. Gleason (2014) Effects of sensory modalities on mating success in the Drosophila neocordata and Drosophila austrosaltans. 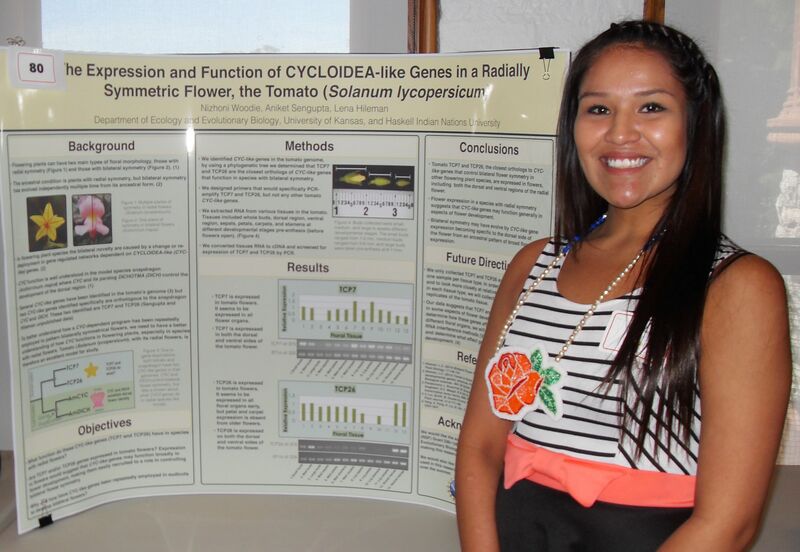 Contributed poster presented at the 41st Annual Meeting of the Society for the Advancement of Chicanos and Native Americans in Science, Los Angeles, CA. Jacobs, J., C. Hutter and R.E. Glor (2015. Phylogenetic analysis of the Mantidactylus lugubris complex with the description of a new species endemic to Madagascar CSULB, College of Natural Science and Mathematics (CNSM) Student Research Symposium. Long Beach, California. Long Beach, California. Poster. Jacobs, J., C. Hutter and R.E. Glor (2015) Phylogenetic analysis of the Mantidactylus lugubris complex with the description of a new species endemic to Madagascar. Annual Biomedical Research Conference for Minority Students (ABRCMS). Seattle, Washington. Poster. Jacobs, J., C. Hutter and R.E. Glor (2016) Phylogenetic analysis of the Mantidactylus lugubris complex with the description of a new species endemic to Madagascar. The Society for Integrative and Comparative Biology (SICB) Annual Meeting, , Portland, Oregon. Poster. Kerbs, B., D. Crawford and M. Mort (2015) Phenotypic novelty and the potential for speciation via stabilization of hybrid recombinants in Tolpis (Asteraceae). Contributed poster. Botany, Alberta, Canada. Odu, C, K. Colyott and J.M. Gleason (2014). Multimodal Signaling and Mating Success in Drosophila saltans. Contributed poster presented at Evolution. Raleigh, NC. Colyott, K, C. Odu, and J.M. Gleason (2014) The Effects of Sensory Cues on Drosophila saltans courtship and mating. Contributed poster. Annual Meeting of the Kansas Academy of Science and the Kansas Entomological Society (Presented by K. Colyott). Pen, I.A.M., R. Bowen, D. Fernando, and K. Jensen (2018) A redescription of the elusive elasmobranch tapeworm genus Myzocephalus. Contributed poster presented at the 45th Annual Meeting of the Society for the Advancement of Chicanos and Native Americans in Science, San Antonio, TX. Resurreccion, M and F. Agusto (2018) Effects of Breeding Peak Phenology on Avian Malaria Transmission Model. Contributed poster presented at the 45th Annual Meeting of the Society for the Advancement of Chicanos and Native Americans in Science, San Antonio, TX. Settlecowski, A., and J. K. Kelly (2013) Testing the coalescent with whole genome data. Contributed poster presented at the Biology Enthusiasts' Association of Students at Tulane (BEAST) Undergraduate Biology Research Symposium. Tulane University, New Orleans, LA. Settlecowski, A. and J. Kelly (2014) Testing the Coalescent with Whole Genome Data. Contributed poster presented at Evolution. Raleigh, NC. Wei, L. (2015) Communicating science: from theories to talks. Tanner Conference, Wellesley College.